Pinot Noir by Ashton Hills of Adelaide Hills. . . .
Ashton Hills vineyard has evolved substantially since it was planted in 1982, a time when modern viticulture in the Adelaide Hills was just starting to be embraced. The clonal development of the vineyard has been a critical element in the final blend of each wine, taking advantage of the individual character of each clone in a given vintage. Over the past 26 years, significant changes have been implemented in the vineyard, with the grafting or removal of nearly all other varieties to complete an estate that is dominated by pinot noir, but with a small parcel – just eight rows – of top notch riesling remaining. The winery itself has an earthen floor and what is best described as limited winemaking equipment. Grapes are all hand picked and gently destemmed, via a small customised, gentle destemmer that keeps as many whole berries as possible. Fermentation involves open air tanks and regular hand plunging with temperatures monitored and managed utilising the cool night time temperatures common during harvest. In addition to the Ashton Hills estate, Stephen draws fruit from the cemetery near Uraidla in Piccadilly Valley, to make Piccadilly Valley Pinot Noir. As the site is warmer, drier and has deeper soils, the fruit at Cemetery Block is typically picked a couple of weeks earlier and the wine showcases the character of the site with more muscle and ripe fruit flavour than the higher and cooler Estate vineyard. To round off the range with something a little different, Stephen has consistently sourced fruit from Wendouree’s acclaimed vineyards in the Clare Valley to make a spectacular Sparkling Shiraz. Wendouree is one of the most famous red wineries in Australia and a place that Stephen knows well, given he has been making the wine there for over 40 years. Despite his modest protest to the contrary, Stephen’s winemaking CV is an enviable one, with his life’s work at Ashton Hills complemented by three decades of winemaking at Wendouree, one of Australia’s most revered and unique wineries. The contrast in style between the elegant and delicate wines of Ashton Hills and the extraordinarily powerful wines of Wendouree could not be greater, and yet Stephen has managed to achieve resounding success in both. 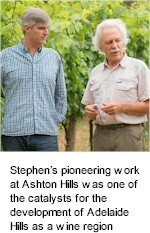 Stephen’s pioneering work at Ashton Hills was one of the catalysts for the development of Adelaide Hills as a wine region. Along with Brian Croser, Stephen was one of the key players to put Adelaide Hills on the map with his resolve to produce the best pinot noir in the country from his site in the Piccadilly Valley. 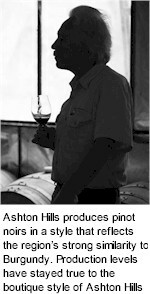 Following 30+ vintages at Ashton Hills, Stephen has become recognised as one of Australia’s finest makers and growers of pinot noir. His philosophy on the winemaking process is very simple, with a focus on minimal intervention and movement of the wine.